Be in the surf or watch the surfers from your lanai. A casual walk to the Foodland grocery store and lots of restaurants. The park across the street offers tennis and basketball courts, a skate board park and roller skating oval along with a children's playground. It is also fun to watch the little leaguers or Pee Wee football. In the same building you can sign up for a scuba trip or class, rent a bike or go to the Surf-Side Deli for great local food. The kitchen and living room are comfortable with views of the ocean and great sunsets. The kitchen has everything that you should need including spices and a rice cooker. The bedroom has a queen size bed and extra TV. A luxury hotel is $500.00 a night, gasoline $4.25 per gallon. Why not be comfortable, feel at home and save a bunch. Cook or BBQ if you want, OR go out with the money you save. Complimentary high speed internet (hard wired or wireless). 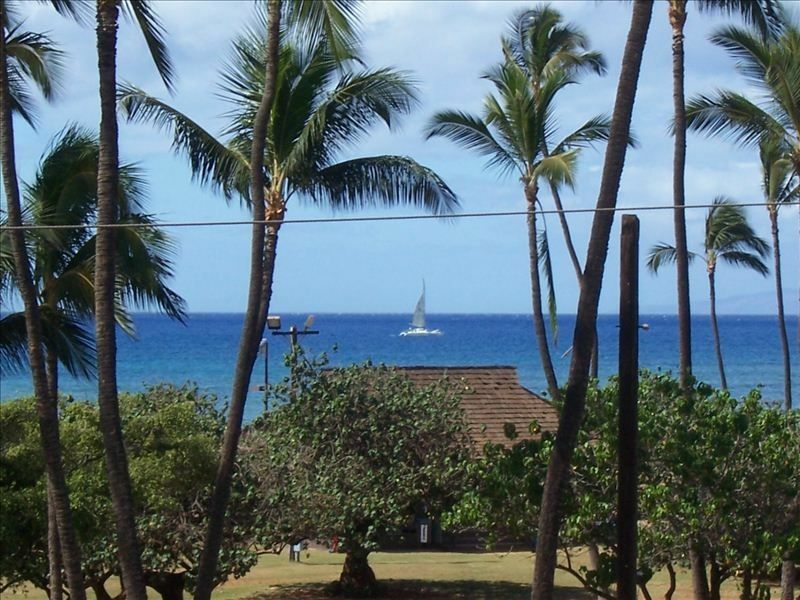 We also have a two bedroom condominium at Maui Parkshore (1.3 miles south, VRBO listing 185387). We try to have everything you might need for a comfortable vacation including laundry, dishwasher and dish soap. Bring your own perishable groceries and swimsuit! Oops - Don't forget suntan lotion. Located directly across the street from Kalama park and Cove Park and walking distance to many wonderful beaches. Watch the surfers and paddle boards from your lanai. See the dive boats at Molokini. Great location, great communication from owners, would highly recommend to stay here. Delightful, comfortable Unit with great view and extra amenities. This unit went beyond our expectations. A big plus was the extras available, beach chairs, umbrella, coolers, etc. The unit was plenty big for the two of us. Beautiful furniture in the bedroom. The real star is the view from lanai. Great view and location. Appreciated all of the available items such as coolers and beach chairs. Clean and nice condo in a great location. Enjoyed our stay and appreciated the owners prompt response to getting us fresh blankets for the pull out couch and a working coffee maker. We especially appreciated the beautiful view from the lanai! More than we expected!! Well equipped with everything you could need for your trip. We loved the condo, the view from the lanai was beautiful, close to everything, Bars, restaurants, beaches, stores, etc. Nice to walk to so many places. Plenty of parking in a nice lite up parking lot that felt very safe. Nice pool. We would definitely stay here again whenever we come back to Maui. Quick response from Marian, everything went so smoothly. Thank you Marian, we loved Island Surf!